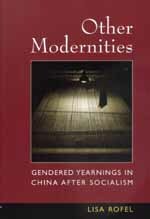 In this analysis of three generations of women in a Chinese silk factory, Lisa Rofel brilliantly interweaves the intimate details of her observations with a broad-ranging critique of the meaning of modernity in a postmodern age. The author based her study at a silk factory in the city of Hangzhou in eastern China. She compares the lives of three generations of women workers: those who entered the factory right around the Communist revolution in 1949, those who were youths during the Cultural Revolution of the 1970s, and those who have come of age in the Deng era. Exploring attitudes toward work, marriage, society, and culture, she convincingly connects the changing meanings of the modern in official discourse to the stories women tell about themselves and what they make of their lives. One of the first studies to take up theoretically sophisticated issues about gender, modernity, and power based on a solid ethnographic ground, this much-needed cross-generational study will be a model for future anthropological work around the world. Lisa Rofel is Assistant Professor of Anthropology at the University of California, Santa Cruz.